The McLaren 650S Can-Am has been launched to commemorate the 50th anniversary of the 1966 inaugural race season of the Canadian American Challenge Cup. This was the same season that spawned the five back to back championship wins for the McLaren team from 1967-1971. Only 50 units of the 650S Can-Am will be sold in the UK at £255,850 (Rs 2.5 crore approx). While it's based on the McLaren 650S Spider, the limited edition 650S Can-Am distinguishes itself with extensive use of carbon fibre on the bonnet, airbrake, front splitter, rear bumper centre, door blades, and 650S Can-Am branded sill covers. The car also gets a carbon fibre retractable hard top and a monocell chassis. It runs forged alloy wheels with gloss black finish and diamond cut rim with Pirelli P Zero Corsa tyres with carbon ceramic brakes and black painted callipers. The carbon-fibre louvered front wing along with the polished stainless steel exhaust system are the other changes on the outside. The cabin also employs carbon fibre elements with a Can-Am inspired driver's door and usage of leather and Alcantara in the seats. The car will be available in three colour options, namely Mars Red, Papaya Sparkonyx and Black. At the launch of 650S Can-Am, Paul Mackenzie, executive director of McLaren Special Operations said, "Can-Am racing is a major part of McLaren heritage, and this latest model from MSO pays homage to the cars and the racers who played a key role in making the championship such a spectacle during the 1960s and 70s. The championship was a true test of the engineering ability, driving talent and bravery of Bruce (McLaren) and his teammates, which led them to secure five consecutive championships. The 650S Can-Am is a modern day interpretation with a mixture of functional design features taken from the all-conquering models, combined with the lightest and most pioneering materials available, as was the case with the race cars. The extensive use of lightweight visual carbon fibre, including for the retractable hard top, adds to car's dramatic appearance and with the roof down, drivers are treated to a stirring V8 soundtrack just as Bruce and his teammates enjoyed." The McLaren 650S Can-Am borrows its engine from the 650S Spider featuring the 3.8-litre twin turbo V8 producing 650PS/687Nm. 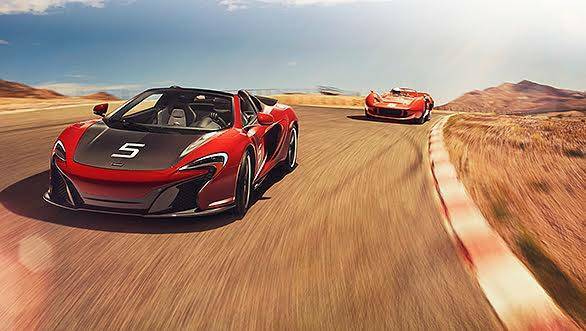 The McLaren 650S Spider can do a 0 to 100kmph sprint in less than 3 seconds with a top speed of 329kmph and we expect the 650S Can-Am to go even faster.